Since Mellanox announced last year that it was for sale, there have been rumors of many potential buyers— Microsoft, Intel, Xilinx, AMD , and even IBM. 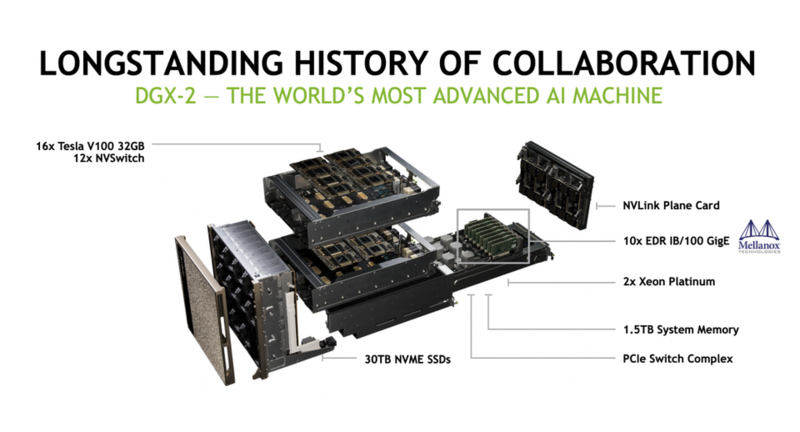 Interestingly, the final winner, NVIDIA, was rarely mentioned, even though the companies have a long-standing partnership and common interests in high-performance computing. Let’s take a quick look at the three big reasons why this deal makes more sense. NVIDIA’s DGX2 AI server uses Mellanox interconnects. NVIDIA and Mellanox are more than just semiconductor companies; they deliver comprehensive platforms that add value beyond the advanced chips they sell. As platform companies, they have both become quite “sticky.” When Intel introduced the embedded OmniPath interconnect, some pundits predicted this would lead to the death of Mellanox. Instead, Mellanox demonstrated how difficult it is to displace. It provides libraries of software that can exploit its clients’ advanced HPC needs, tuning its interconnects to deliver high bandwidth and low latency for specific use cases. Likewise, NVIDIA delivers tremendous value through its software, such as CUDA, CuDNN, TensorRT, and most recently its RAPIDS library for Machine Learning acceleration. Again, these software tools will reduce the temptation to consider replacing NVIDIA with other products, such as Google GOOGL -0.98% TPU. As a combined company, they can leverage their platforms to each other’s advantage.